Eclaire Jardinage: choux pastry, red cookie dough, crème pâtissière, confiture tayberry, bavaroise pistache, mousse tayberry, chantilly pistache, almond decoration. 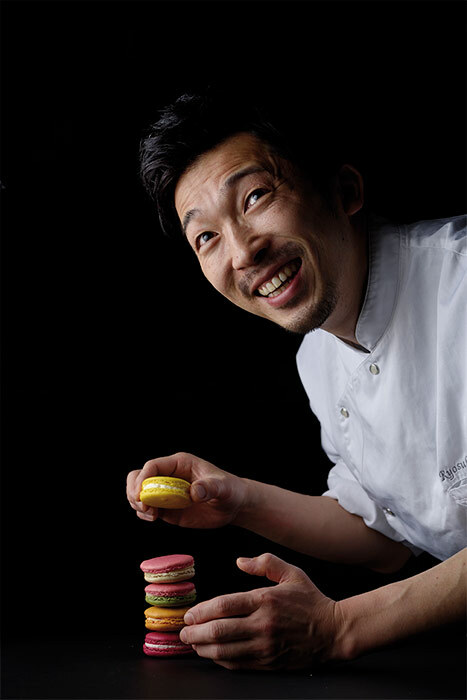 Ryosuke Sugamata was a competent pastry chef at Deux Patisserie when he showed a reconstructed crème caramel in previous so good #10 and he now owns his pastry shop in Yoga, Tokyo that he made his dream come true at last in 2015. With the experience as a sous chef at Pierre Hermé Salon de Thé in Japan and the fame as a master of macaron, one of his specialties sitting in the brightly-lit showcase is macaron, naturally. 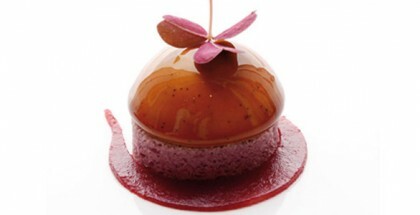 He even transforms the fragile delicacy from France into individual cakes with seasonal ingredients. When looking into the showcase at Ryoura, it is as if the smell of fresh fruits decorating his cakes that break through the glass to your nose. Many chefs think that using more than three main ingredients in a cake is likely to mask their pure tastes, but he doesn’t think so. “I like to achieve the taste I want by layering various tastes and flavors of ingredients. There should be supporting roles to highlight the leading role. Take sashimi for example. Sashimi is eaten with a small amount of wasabi to mask its fishy smell. I mean, adding something can deduct something you don’t need. That’s the way I invent combinations of ingredients. Tayberry is one of his most favorite ingredients. He found it in France three years ago and its rose-like, flavorful tea-like smell lit his creative fire. It goes well with various ingredients, he thinks. 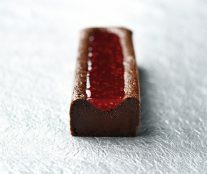 “Coconut is one of the best partners, but I don’t like to cloud the pure taste of tayberry, so I often make it jelly or jam when combining with other ingredients.” He creates “eclairs of the season” through the year and the Eclaire Jardinage with tayberry is the taste of this spring. 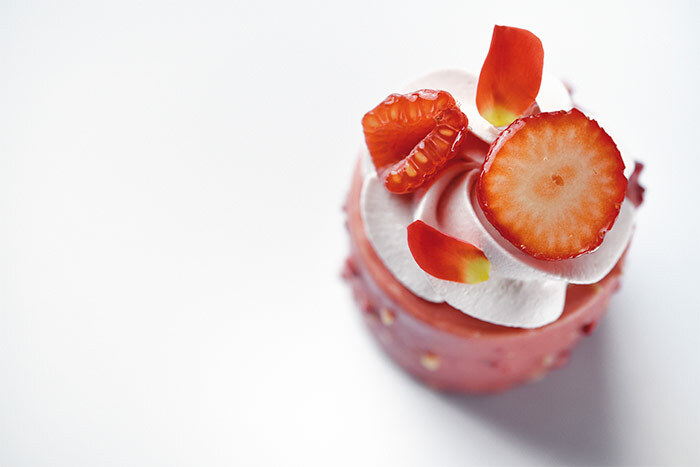 From winter to spring, every pastry chef fills his/her showcase with cakes with strawberries because Japanese adore it. 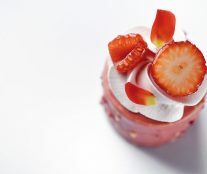 The standard strawberry tactic is simply layering sponge, whipped cream and strawberries because strawberry here tastes best without any tricks. It seems that is why sophisticated strawberry cakes are not around. When you see Eclaire Jardinage, your eyes would transmit such data to your brain that these cakes are pink in color and pink means usual strawberry flavor. But your tongue will be thrilled with unexpected joy. 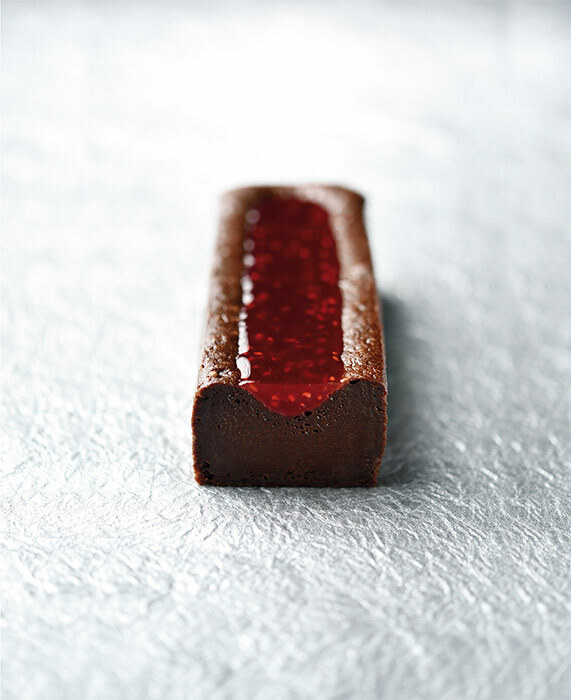 Eclaire Jardinage has some tangy berry flavors and a luscious texture and the rich taste of pistachio cream. With his unique combination, and a superb sense of proportion of ingredients, the taste of his cakes always betrays the appearance in a good sense even though each ingredient is familiar. When it comes to the designs of the cakes, he is almost fussy about straight lines and curved lines. 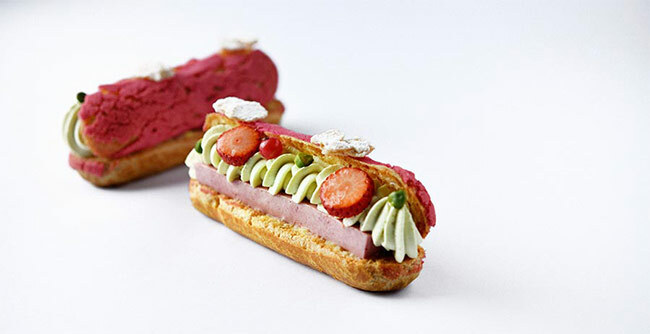 “Look at Eclaire Jardinage, and the line of Mousse Tayberry and whipped pistachio cream above it. I wanted to make a good contrast of line and whirls”. Put butter, milk, water, sugar and salt in a pan and bring it to boil. Remove from the heat and add shifted cake flour. Transform the mixture to mixer bowl and add egg in several parts while beating. Beat everything in a mixer. Mix the first four ingredients well. Heat milk, fresh cream and vanilla bean. Add the milk mixture to the egg yolk mixture. Cook it thoroughly. Heat purees to about 45℃ and add the mixture of sugar and pectin. Boil it for a minute and pour into a baking pan. 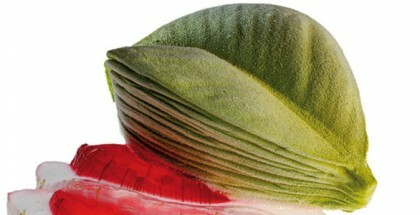 Whisk with hand blender when used. Make crème anglaise with milk, vanilla powder, egg yolks and sugar. Add gelatin to crème anglaise and strain. Add pistachio paste. Beat fresh cream until soft peak forms and add to the pistachio mixture. Pour into a 57cm x 37cm mold and put in a freezer. 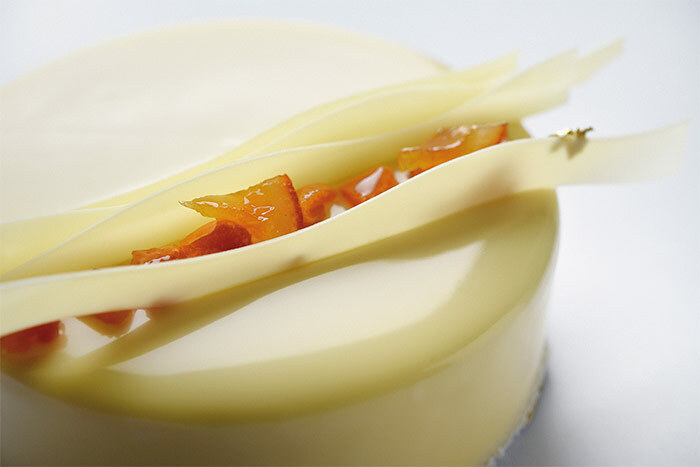 Make crème anglaise with 1/3 amount of the mixture of three purees, egg yolks and sugar. Moisten gelatin with water and add to the crème and strain. Add the rest of the purees and let cool to 24℃。Beat fresh cream until soft peak forms and combine with the berry mixture. Pour over the Bavaroise Pistache and put in a freezer. Cut into 11.5 x 1.5cm. Beat fresh creams and sugar and add pistachio paste. Mix everything gently with rubber spatula and spread on a baking pan. Bake at 155℃ for about 10 minutes. Pipe the choux pastry on a baking pan and top with the Red cookie dough. Bake at 190℃ at first and lower to 170℃ for one hour in total. Cut the choux horizontally and pipe crème patissiere and Confiture Tayberry. 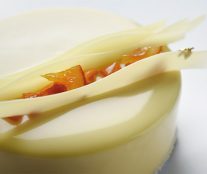 Place the layers of the bavarois and the mousse and pipe Chantilly Pistache. Top with strawberry, red currant, pistachio and almond decoration.